Yep, the day looks to be Friday, July 5, 1963, vs the Pirates. And yes, the Mets lost, 3-1, thanks to a 2-run HR by Clemente off Tracy Stallard in the 8th inning, which would be their 8th straight loss. They would go on to lose 15 straight before halting the streak, and lose 111 that year (3rd worse Mets total ever). Below, Casey and likely Ernie White chatting with what appears to be the new Miss Rheingold for 1964 (or at least a candidate)! Solly Hemus is at home plate hitting fungoes. Duke Snider comes to the the plate in the bottom of the 2nd inning, with Frank Thomas on deck. Don Cardwell pitching, Jim Pagliaroni the catcher, Bob Bailey at third, Johnny Logan at short. Snider would strike out. Bottom of the 5th inning. “Duke Snider, an All-Star Game outfielder currently batting .221, tapped the ball down to the Pirate first baseman, Donn Clendenon, and Clendenon decided upon a foot race. Snider won it. Clendenon stabbed the bag with his long left leg, but the Duke beat him by a foot.”, as the Mets fans rejoice. Tim Harkness then doubled him in for the early lead, but it would be Mets’ only run of the afternoon. Three more months at the old Polo Grounds, and it was over. Duke would go on to the San Francisco Giants, the Mets would go on to Queens, and the Polo Grounds would fade into memory, but hardly forgotten. Beautiful shots! It took me back to the days when my Dad would always get tickets on third base (from a ticket agency on Halsey Street in Newark, NJ). 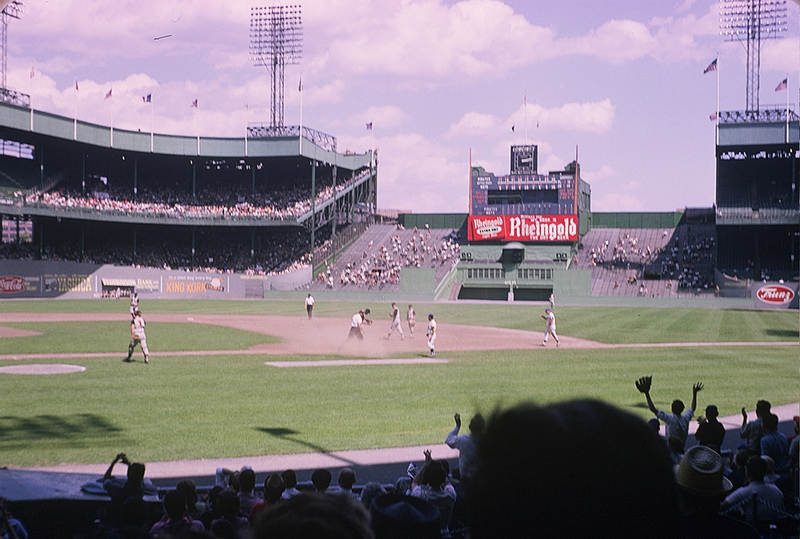 I loved the Polo Grounds (never made it for the Giants for I was only 6 when they left after the ’57 season) and hungered to see NL ballgames (I was a big Dodger fan). In ’62 I saw the first Met Old-Timer’s Game between the 1951 Dodgers & Giants and saw Jackie Robinson walk right by me on the third base line. I was in awe! I was 11 years old. That same summer I attended Ted Williams Baseball Camp in Lakeville, MA the last 2 weeks of Aug. & walked side-by-side with another American icon. Baseball has had a huge impact on my life. 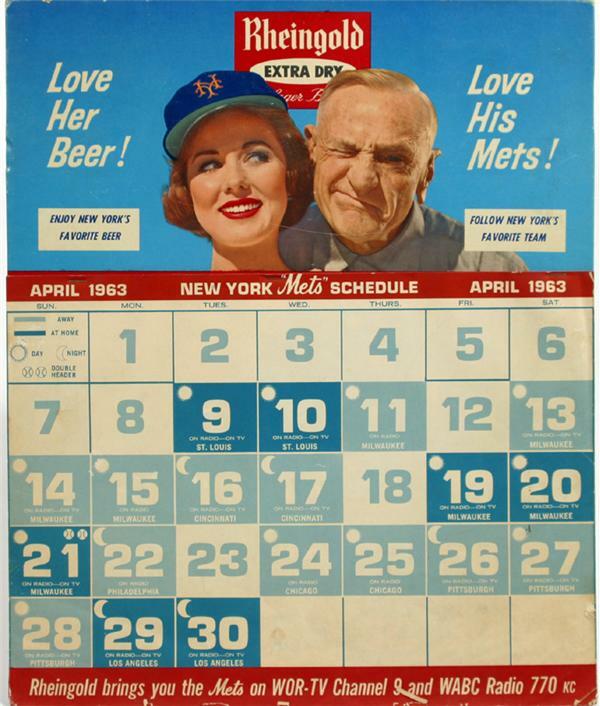 I guess that Met game on Friday, July 5, ’63 was an odd day game for a Friday because of possible 4th of July festivities later that night. Do you agree? Let me know and thank you Tom for bringing sunshine to my home in the dead of winter! Hi Tom, very cool post! 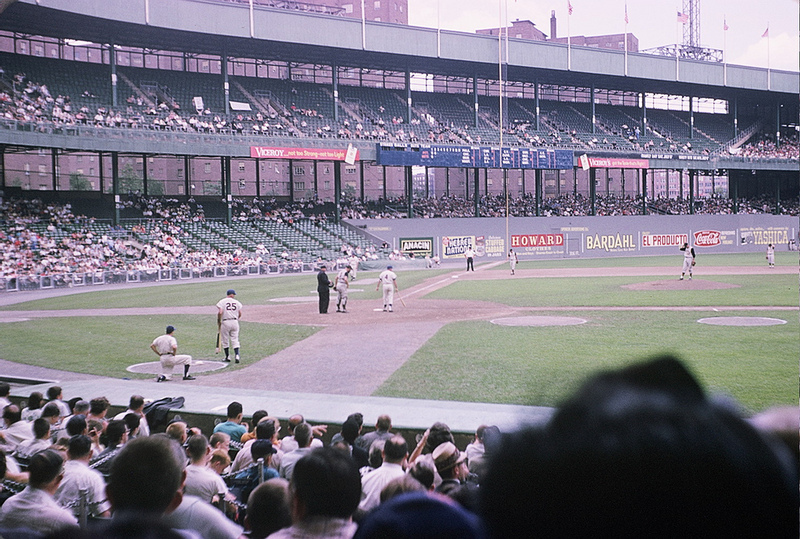 I was 9 years-old in 1963, and my father took me to see the Mets play the Milwaukee Braves at the Polo Grounds. It was my very first major league game. What I remember most was coming out of the tunnel and seeing the huge ballpark. I lived in the New Jersey suburbs, but I’d never seen grass so green. Warren Spahn pitched for the Braves, and of course being 1963, the Mets lost. But, I didn’t care. I loved my Mets! I saw the last game Casey Stengel managed. 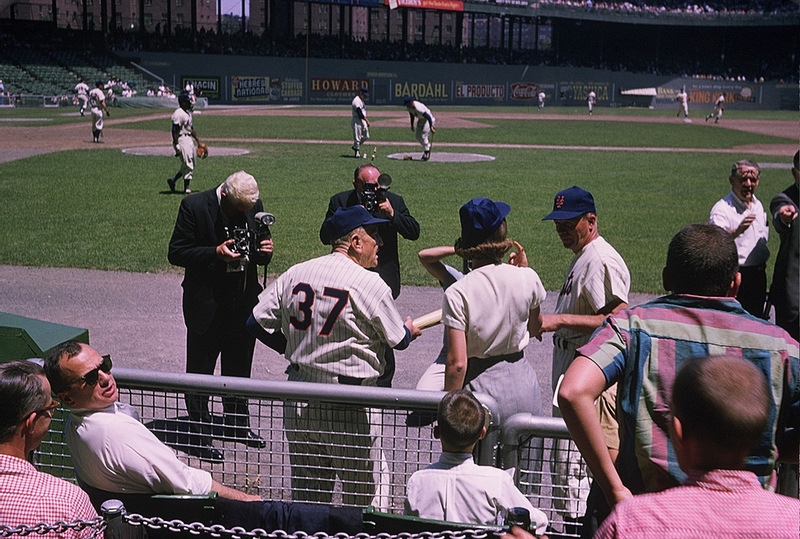 July 24,1965 – Old-Timers’ Day at Shea Stadium. Since there were no exclusively “Mets” old-timers yet, the game was between the New York Giants and Brooklyn Dodgers. I knew my baseball history, so I was in complete awe. After the game, Casey fell – getting out of a taxi cab at the post-game dinner, in the men’s room at the restaurant, or off a bar stool, depending on which version you believe. He broke his hip, and that was it for the Old Perfessor. In my early-20s, I moved to Los Angeles, and was in a rock band with Marty Moore, whose grandfather, Johnny Moore had played for Chicago in the 1930s (Babe Ruth hit his “Called Shot” over Moore’s head in the outfield). Johnny and Casey were good friends. When Casey passed away, his housekeeper-nurse, June Bowlin called Marty’s mom, and asked if we’d come over to the Stengel house in Glendale and paint the swimming pool, so the house could be sold. It was like a dream come true! The pool was right behind their house, and alongside the pool were the two seats from the Polo Grounds where Casey and Edna met. As a boy, I had read about these seats – and there they were. Casey’s name was stenciled on one and Edna’s on the other. When we were done painting, Ms. Bowlin invited us to take a walk through a little summer cottage in the back yard. Wall-to-wall was every kind of Casey-abilia imaginable. There were yearbooks going back to 1912, racks of uniforms, caps, cleats, bats, balls, gloves, photos of Casey with movie stars, presidents and kings! I’ve never seen anything like it before or since. We were in there for at least a half hour. Only a small portion was ever displayed at Cooperstown. It was a virtual history of the modern game of baseball from the 1910s through the 1960s.